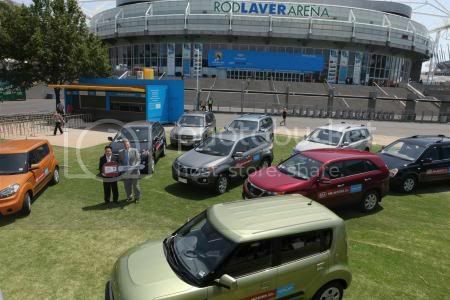 This weekend, Kia Motors tossed the keys to the 105th Australian Open for a fleet of 101 Kia courtesy vehicles. As a major sponsor and automobile supplier to the Open, Kia will transport players, officials and VIPs to and from Melbourne Park for the ninth consecutive year. Meanwhile, at Kia showrooms leading up the tournament, fans could also enter a Kia Lucky Drive to Australia campaign for a trip to the tournament. Kia distributors in 16 countries around the world selected 53 customers to attend the second week of the Australian Open. On-site, Kia Fan of the Day and Fan of the Australian Open competitions will again be held. Todd Woodbridge, one of the world's most successful doubles players and a native of Australia, will be Kia's brand ambassador throughout the Open, as featured in a TV advertising campaign and series of blogs at www.kia.com.au/tennis. For fans that can't make it to the grounds, Kia will provide the opportunity to view the tournament on outdoor giant screens throughout Sydney and Melbourne. Thank you to everyone for their feedback. Upon review of the comments, we have decided to remove the video for the time being as we believe there is some content that is not appropriate. We will consider reediting some of the content and reposting at a later date. In the mean time, here's a short version of the video for you.